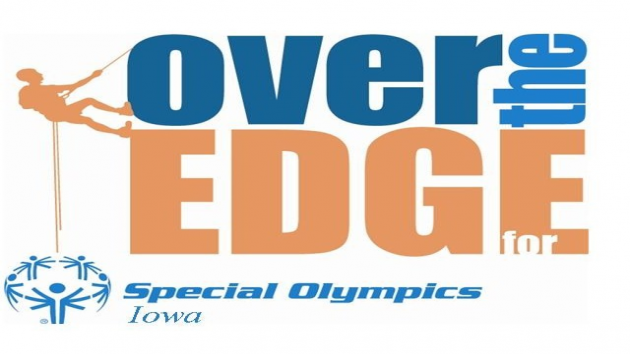 This week I was fortunate enough to be involved with Special Olympics Iowa’s annual “Over The Edge” Fundraiser. 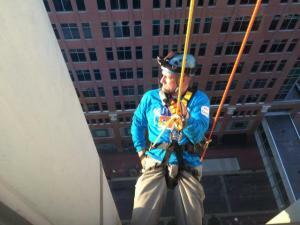 The event had me rappelling 345 feet down the side of the Financial Center in downtown Des Moines. In this blog post I’ll tell you all about the experience. 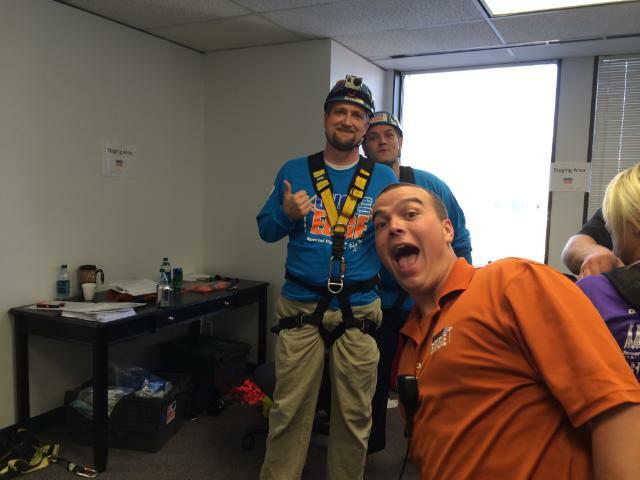 There’s YouTube Video of the rappel at the bottom of this post. The day of the rappel I woke an hour earlier than usual. Maybe it was nerves. Maybe it was excitement. It was probably a mix of both! It was going to be a long day as I didn’t need to check in until 5pm and I’d be going “Over The Edge” around 6pm. That morning as my family got ready for the day I tried not to talk about it too much. One of my daughters was all for me doing it. The other one… not so much. I didn’t want to upset her. 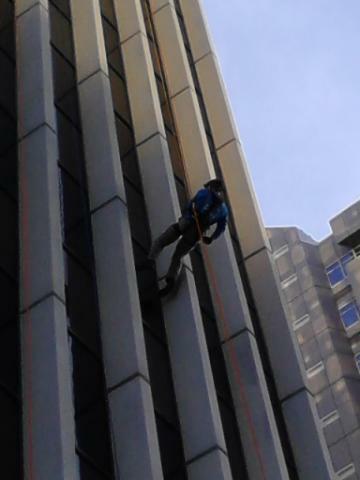 Even though I wasn’t afraid that I would actually die doing this (although I did need to sign a waiver holding the company I work for harmless in the event of accidental death or injury)… I did give my daughters and wife extra long hugs that morning and made sure to tell them I loved them more than once. The work day seemed to drag on and I found it hard to focus. I was able to wrap up the day a little early and headed towards downtown Des Moines around 3:30PM. 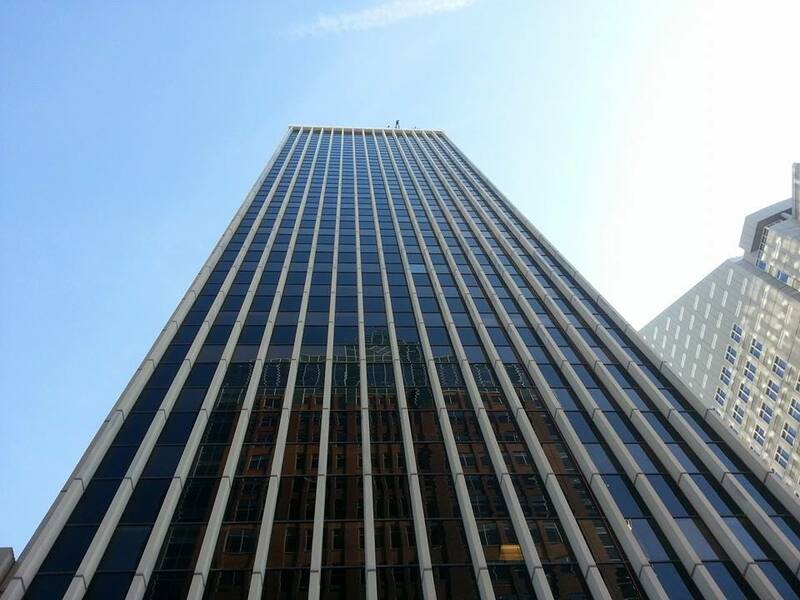 Before leaving I noted the address of the building I’d be rappelling off of; 666 Walnut. Seriously? 666! Oh, well. I was committed and ready to do it. Although, some of my friends thought I should be committed for trying. I arrived in plenty of time to soak in the atmosphere. That’s when things got real. Standing at the bottom of the Financial Center looking up I could finally grasp the magnitude of 345 feet! It was neat to see the other people rappelling down and how excited it made the crowd and the Special Olympic athletes that were on hand for the event. Come on! 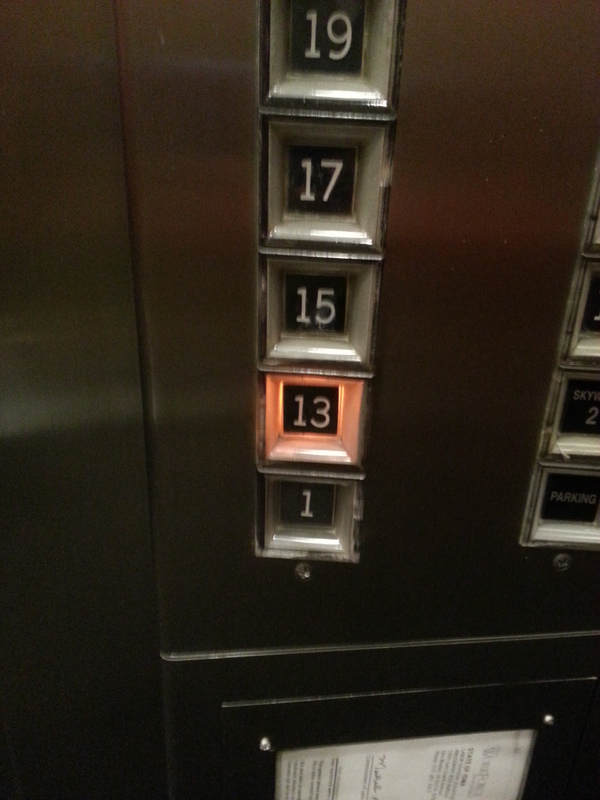 First 666 and now I check in on the 13th floor! I pressed on. After all, there was really no way I could back out. I had been talking about it on the radio for weeks and had blogged about it several times too. Check in was a breeze. I need to fill out an info sheet that the announcer would read as I made my descent. There was also another waiver I need to initial in 9 different places and sign. I really couldn’t tell you what all I initialed. I didn’t want to get freaked out. With all the paperwork done it was time to get geared up. The group I was with was lead down a long hallway to the gear room. That’s where we covered safety and put on the harness that would keep us safe. 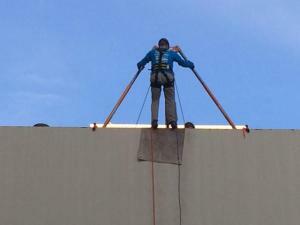 Let me tell you… the harness was snug. Not uncomfortable, but snug. 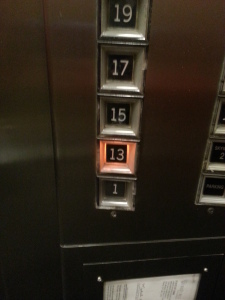 There was something oddly comforting about it. Maybe it was some primal womb type thing. I’m really not sure but it did make me feel safer and put me at ease. At this point I should highlight all the amazing workers at this event. Their attention to detail, explanations, and calming confidence were great. All geared up it was time to practice. 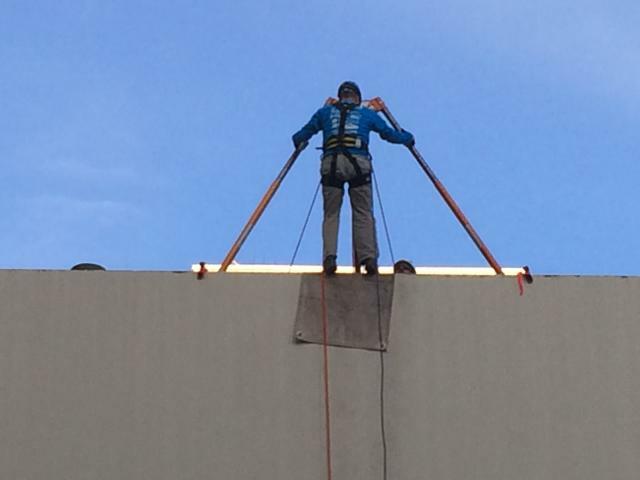 We went out on to a roof and more gear was applied to our harnesses. There was a lever we’d slowly pull towards our bodies to go down. Push it up and we’d stop. If for some reason we dropped fast our emergency “brake” on another line would stop us. The practice rappel was a 3 story drop. It went well. I tried to remember the advice a friend of mine who works on tall towers gave me. He said, “Trust the equipment and relax.” That was excellent advice. Now it was time to the main event. 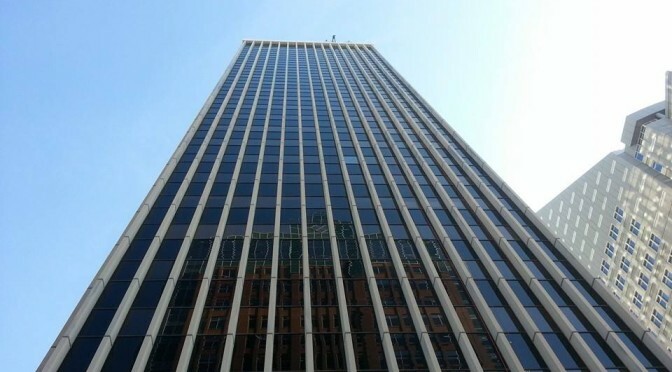 An elevator ride 25 floors to the top, a few stairs, and we were standing on the top of the Financial Center. The view was AMAZING! I could see for miles. I don’t think we could have asked for better weather. A few more instructions… more safety checks and it was time! I approached the edge and was attached to the lines. Time to step up on the ladder and onto “the edge”. 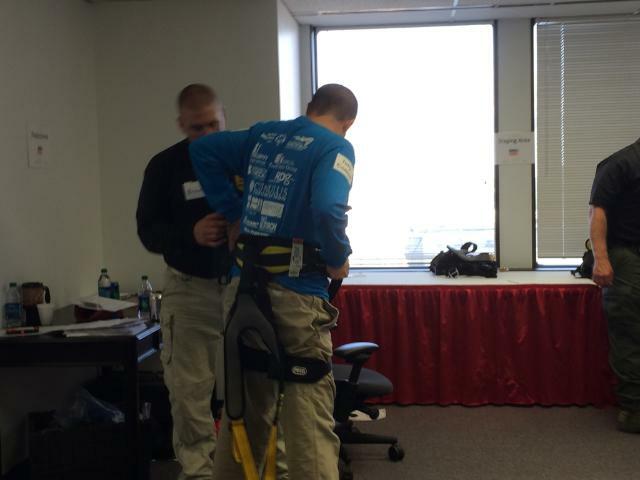 “Trust the equipment and relax… Philippians 4:13… and the Special Olympics oathe (Let me win. But if I cannot win, let me be brave in the attempt) were all going through my mind. The next thing I knew I had leaned back, lowered a bit with 2 feet on the side of the building, and was getting my picture taken. Now just 345 feet to the bottom. I slowly started my way down looking all around. There was a Go Pro camera on my helmut that I borrowed from a friend and I wanted to get some good video. The first half of the way down was amazing. You really could see everything… including a great view of where the Downtown Younkers was before the fire this past Winter. The last half was what made me the most nervous. As I’d go down a little faster than I’d want I’d apply the brake. That lead to a little bouncing, like a rubber band. The bouncing would bring my feet off the building and that made me uneasy. Just when I was running out of gas both physically and mentally a State Trooper came down the other line beside me. Hearing her call out my name and saying I was doing a good job helped me keep going. Eventually I made it all the way down. What a feeling it was to have two feet planted firmly on the ground. It was also great to hear the cheers from my family and friends that came to watch! 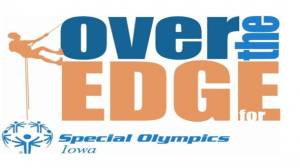 I’d love the opportunity to do it again next year and am even thinking about taking part in Special Olympics Iowa’s Polar Plunge in November. What’s the most exciting, scary, and rewarding thing you’ve done?